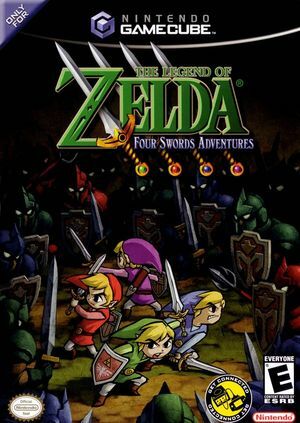 The Legend of Zelda: Four Swords Adventures is a video game in Nintendo's The Legend of Zelda series. It was released for the Nintendo GameCube in Japan on March 18, 2004; in North America on June 7, 2004; in Europe on January 7, 2005; and in Australia on April 7, 2005. The Game Boy Advance hand held game console can be used as a controller when using the Nintendo GameCube Game Boy Advance Cable bundled with the game. This title supports GameBoy Advance connection support can be supported via joybus emulation. Such requires VBA-M (r947 or newer) and a dump of GBA BIOS. Emulation => Uncheck "Pause when inactive"
Options => Game Boy Advance => Check "Use BIOS file"
Options => Link => Check "Local mode"
Options => Link => Check "Link at boot"
Remember your controller settings are setup in VBA-M. VBA-M will treat each player as "Player 1", so make sure you setup different controller configurations for each. You could make a copy of the VBA-M directory to have multiple configs. VBA-M does not correctly handle the audio from the Navi Trackers mode. This is not a fault of Dolphin, as a modified version of mGBA does not share the issues and works properly. The Built-in Widescreen Hack does nothing in this game. The following Gecko codes work as a replacement. The graph below charts the compatibility with The Legend of Zelda: Four Swords Adventures since Dolphin's 2.0 release, listing revisions only where a compatibility change occurred. r6887 Windows Vista Intel Core 2 Duo T8100 @ 2.2GHz ATI Mobility Radeon HD 3470 Playable: Could play until the Moon Gate crash. 50-60FPS with DX9 plug-in and OpenCL enabled. r7714 Windows 7 Intel Core i3-370M @ 2.4GHz ATI Radeon HD 6370M Fully playable: No slowdowns, no known glitches. 3.0-377 Windows 7 Intel Core i7-2600K ATI Radeon HD 6850 Work great, but the game can freeze/slowdown on when you enter a moongate. Fixed the problem with "Skip EFB access from CPU". 3.0-436 Windows XP Intel Core 2 Duo E4500 ATI Radeon HD 2600 XT Runs okay, 25-35FPS. Stable until you attempt the massive headache that is multiplayer. Audio completely cuts out when connecting to VBA-M besides audio from the Gameboy. VBA-M crashes on LLE. There is some minor slowdown that can affect gameplay. This page was last edited on 2 May 2018, at 20:19.